Last time we looked at how to use the Poller to work with multiple sockets, and detect their readiness. This time we will continue to work with the familiar request/response model that we have been using thus far. We will however be beefing things up a bit, and shall examine several ways in which you can have more than one thread pushing messages to the server and getting responses, which is a fairly typical requirement (at least in my book it is). As you may have realised by now, ZeroMQ is a messaging library, and as such, promotes the idea of lock free messaging. I also happen to think this is a very good idea. You can achieve an excellent throughput of messages and save yourself a lot of synchronization pain, if you try and avoid shared data structures. By doing this you will also be saving yourself the pain of having to synchronize access to them. So in general try and work with ZeroMQ in the way it wants to be worked with, which is via message passing, and avoiding locks, shared data structures. Ok so we are nearly at the point where we can start to look at some code, but before we do that, let’s just talk a little bit more about what this post is trying to discuss. In the code I typically write, it is quite common for a bunch of client threads all to be running at once, each capable of talking to the server. If this sounds like a requirement that you have had to deal with, then you may find this post of use, as this is exactly the scenario this post is aimed at solving. 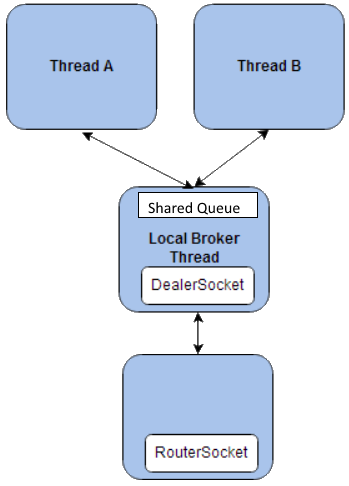 As the aim of this post is to have asynchronous client, we need a asynchronous server too, so we use DealerSocket(s) for the client(s) and a RouterSocket for the server. As with most things there is more than one way to skin a cat, so we will look at a couple of options, each with the their own pros/cons. The first options does need a bit of .NET threading knowledge, but if you have that, then the idea is a simple one. For each client thread we also create a dedicated DealerSocket that *should be* used exclusively by that thread. 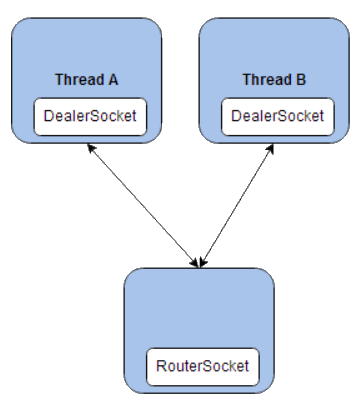 This is achieved using the ThreadLocal<T> .NET class, which allows us to have a DealerSocket per thread. We add each of the client created DealerSocket(s) to a Poller instance, and listen to the ReceieveReady event on each socket, which allows us to get the message back from the server. The obvious downside to this approach is that there will be more socket(s) created on the client side. The upside is that it is very easy to implement, and just works. The next example keeps the idea of a separate threads that want to send message(s) to the server. This time however we will use a broker on the client side. The idea being that the client threads will push to a shared data queue, I know I have told you to avoid shared data structures. Thing is, this is not a shared data structure it is just a thread safe queue, that many threads can write to. Where as a a shared data structure may mean several threads all trying to update the current Bid rate of an Fx option quote price. There is a difference. OK the shared queue will have some synchronization somewhere to make it thread safe, thankfully we can rely on the good work of the PFX team at Microsoft for that. Those guys are smart and I am sure the Concurrent collections namespace is pretty well designed and can be trusted to be pretty optimal. 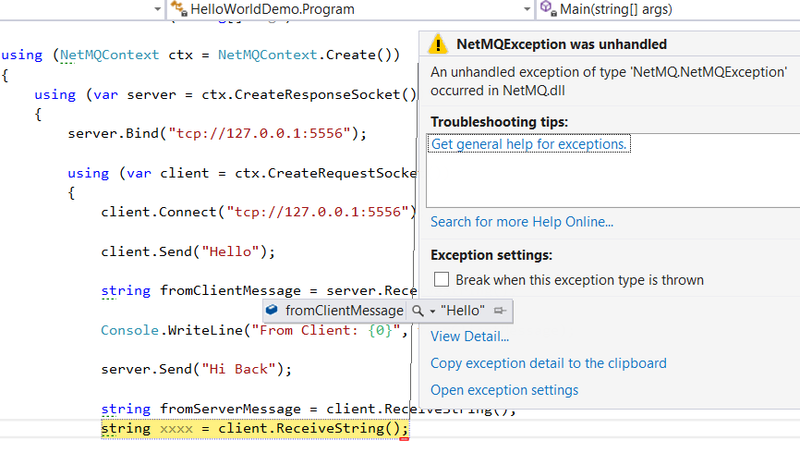 Again we need to call on a bit of .NET know how, so for the centralized queue we use a ConcurrentQueue<T>. All client threads will enqueue their messages for the server here. There will also be another thread started. This extra thread is the one that will be processing the messages that have been queued onto the centralized queue. When there is a message taken of the centralized queue it will be sent to the server. 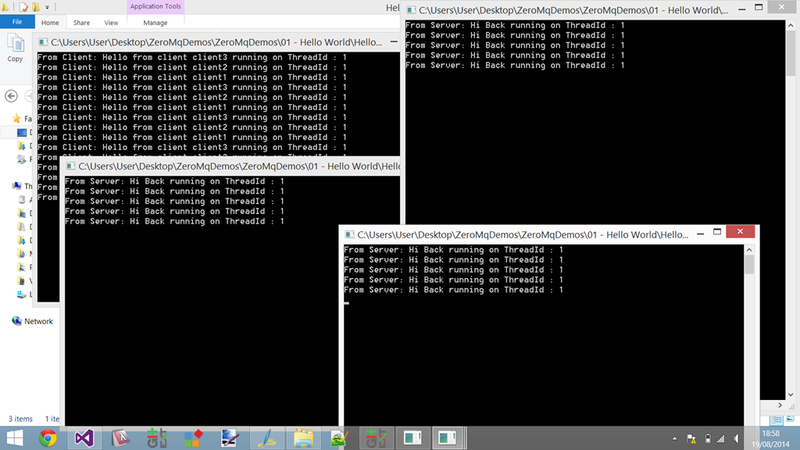 The thing is only the thread that reads from the centralized queue will send messages to the server. As we still want messages to be sent out asynchronously we stick with using a DealerSocket, but since their is now only one place where we send messages to the server we only need a single DealerSocket. We add the SINGLE DealerSocket(s) to a Poller instance, and listen to the ReceieveReady event on each socket, which allows us to get the message back from the server. This is more complex than the first example as there are more moving parts, but we no longer have loads of sockets being create. There is just one. The final option is to use the NetMQ library class : NetMQScheduler. I think the best place to start with that is by reading the link I just included. Then come back here. Oh hello you’re back. Ok so now you know that the NetMQScheduler offers us a way to use TPL to schedule work and that there is a Poller that we pass into the NetMQScheduler. Cool. The NetMQScheduler is a custom TPL scheduler, which allows us to create tasks that we want done, and it will take care of the threading aspects of them. Since we told the NetMQScheduler about the Poller we want to use we are able to hook up the ReceiveReady event and use that to get messages back from the server. The difference here is that since we are using TPL and NetMQ we need to use TPL Task(s) and the NetMQScheduler instance whenever we want to Send/Receive. To be honest, I think I like this design the least, as it mixes up too many concepts, and the TPL stuff tends to be mixing a bit too much with the ZeroMQ goodness for my taste. I did however just want to show this example for completeness. Handling Multiple Sockets, And Why Would You Need To? To be honest there times you may end up with more than one socket per process. And there may be occasions when you only want to use the socket(s) when they are deemed ready. ZeroMQ actually has a concept of a “Poller” that can be used to determine if a socket is deemed ready to use. A good way to look into the NetMQ Poller class is via some tests. I am not going to test everything in this post, but if you want more, NetMQ itself comes with some very very good tests for the Poller. Which is in fact where I lifted these test cases from. As I just stated I am not the author of these tests, I have taken a subset of the NetMQ Poller test suite, that I think may be pertinent to a introductory discussion around the Poller class. NOTE : This series of posts is meant as a beginners guide, and advanced ZeroMQ users would likely not get too much from this series of posts. This test cases use the kind of familiar (hopefully by now) Request/Response socket arrangement. We will use the Poller to alert us (via the xxxxSocket.ReceiveReady event that the Poller raises for us) that the ResponseSocket is Ready. And that is about all I wanted to talk about this time. I hope you can see how you could make use of the Poller in your own socket topologies, and why it is a useful tool. Last time we looked at the different socket types within ZeroMQ, and I also told you their equivalent in NetMQ (which is what I use for these posts). This time we will look at 3 small areas of ZeroMQ, which are none the less very important areas, and should not be overlooked. These areas are socket Options/Identity and SendMore. Depending on the type of sockets you are using, or the topology you are attempting to create, you may find that you need to set some ZeroMQ options. In NetMQ this is done using the xxxxSocket.Options property. To see exactly what all these options mean you will more than likely need to refer to the actual ZeroMQ documentation, i.e the guide. One of the great things (at least in my opinion) when working with ZeroMQ is that we can still stick with a standard request/response arrangement (just like we had in the 1st posts hello world example https://sachabarbs.wordpress.com/2014/08/19/zeromq-1-introduction/) but we may then choose to switch to having an asynchronous server. This is easily achieved using a RouterSocket for the server. The clients stay as RequestSocket(s). The RouterSocket is a personal favourite of mine, as it is very easy to use (as are many of the ZeroMQ sockets, once you know what they do), but it is a capable of creating a server that can seamlessly talk to 1000nds of clients, all asynchronously, with very little changes to the code we saw in part 1. When you work with multipart messages you must send/receive all the parts of the message you want to work with. I think the best way to try and get to understand multipart message is perhaps via a small test. I have stuck to use a all in one demo, which builds on the original “Hello World” request/response demo. We use NUnit to do Asserts on the data between the client/server. 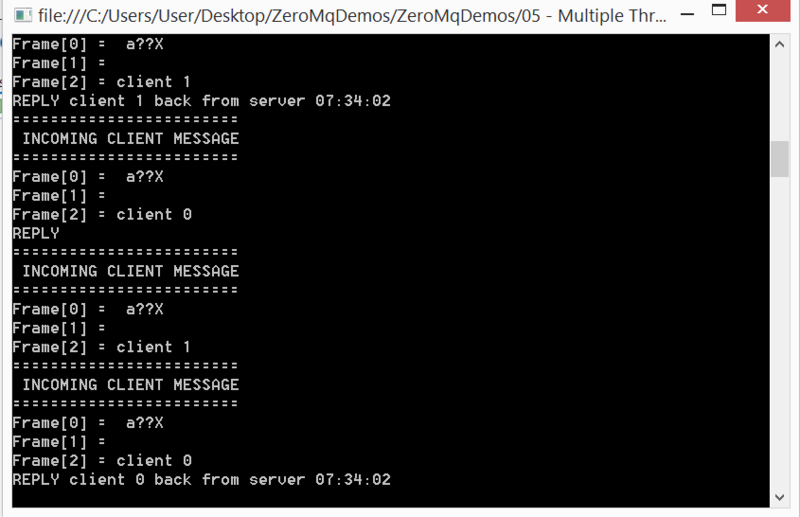 Here are a couple of REALLY important points from the Zero Guide when working with SendMore and multi part messages, this talks about the ZeroMQ C++ core implementation, not the NetMQ version, but the points are just as valid when using NetMQ. 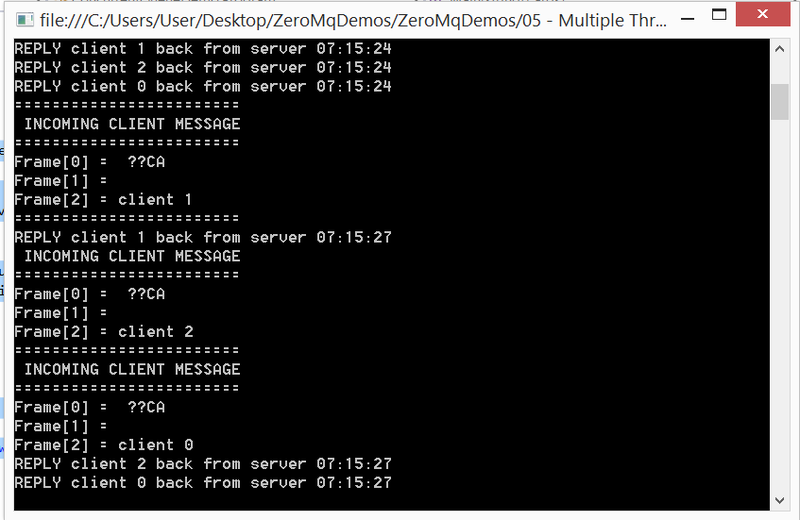 On sending, ØMQ queues message frames in memory until the last is received, then sends them all. That’s all I wanted to talk about in the post, so until the next time then. Last time we introduced ZeroMQ and also talked about the fact that there was a native C# port by way of the NetMQ library, which as I said we will be using from here on out. I also mentioned that the power of ZeroMQ comes from a bunch of pre-canned sockets, which you can use as building blocks to build massive or small topologies. Exclusive pair, which connects two sockets exclusively. This is a pattern for connecting two threads in a process, not to be confused with “normal” pairs of sockets. I personally think it is a very clever thing to have done, to give certain sections of topologies an actual pattern name, as it means you can Google around a certain pattern name. For example I may Google “Lazy Pirate Pattern C#”, and I would know that the results would almost certainly be talking about the exact socket arrangement I had in mind. So yeah good idea giving these things names. Anyway enough chit chat, lets get to the crux of what I wanted to talk about this time, which is the different socket types within ZeroMQ. This is known as a PublisherSocket in NetMQ, and can be used to publish messages. This is known as a XPublisherSocket in NetMQ and can be used to publish messages. XPUB and XSUB are used where you may have to bridge different networks. This is known as a XSubscriberSocket in NetMQ. and can be used to subscribe to message(s) (you can fill in a subscription topic which indicates which published messages you care about). XPUB and XSUB are used where you may have to bridge different networks. This is known as a RequestSocket in NetMQ. Is a synchronous blocking socket, that would initiate a request message. This is known as a ResponseSocket in NetMQ. Is a synchronous blocking socket, that would provide a response to a message. This is known as a RouterSocket in NetMQ. Router is typically a broker socket (but not limited to), and provides routing where it would more than likely know how to route messages back to the calling socket, thus its name of “Router”. It is fully asynchronous (non blocking). The ROUTER socket, unlike other sockets, tracks every connection it has, and tells the caller about these. The way it tells the caller is to stick the connection identity in front of each message received. An identity, sometimes called an address, is just a binary string with no meaning except “this is a unique handle to the connection”. Then, when you send a message via a ROUTER socket, you first send an identity frame. This is known as a PullSocket in NetMQ. This would one part of a work within a pipeline pattern, which would pull from a PUSH socket and the n do some work. This is known as a PairSocket in NetMQ. There are pretty strict recommendations about the pairing of the sockets we just discussed. The standard pairs of sockets that you should stick to using are shown below. The REQ client must initiate the message flow. A REP server cannot talk to a REQ client that hasn’t first sent it a request. Technically, it’s not even possible, and the API also returns an EFSM error if you try it. In the same way that we can replace REQ with DEALER ….we can replace REP with ROUTER. This gives us an asynchronous server that can talk to multiple REQ clients at the same time. If we rewrote the “Hello World” server using ROUTER, we’d be able to process any number of “Hello” requests in parallel. In the first case, the ROUTER simply reads all frames, including the artificial identity frame, and passes them on blindly. In the second case the ROUTER must know the format of the reply envelope it’s being sent. As the other peer is a REQ socket, the ROUTER gets the identity frame, an empty frame, and then the data frame. An asynchronous request with a synchronous server responding. When we use a standard REQ (ie not a DEALER for the client) socket, it does one extra thing for us, which is to include an empty frame. So when we switch to using a Dealer for the client, we need to do that part ourselves, by using SendMore, which we will get into within the next post. If we rewrote the “Hello World” client using DEALER, we’d be able to send off any number of “Hello” requests without waiting for replies. With DEALER and ROUTER to get the most powerful socket combination, which is DEALER talking to ROUTER. It gives us asynchronous clients talking to asynchronous servers, where both sides have full control over the message formats. An asynchronous request with an asynchronous server responding (this should be used if the DEALER is talking to one and only one peer). With a DEALER/DEALER, your worker can suddenly go full asynchronous, sending any number of replies back. The cost is that you have to manage the reply envelopes yourself, and get them right, or nothing at all will work. We’ll see a worked example later. Let’s just say for now that DEALER to DEALER is one of the trickier patterns to get right, and happily it’s rare that we need it. An asynchronous request with an asynchronous server responding. Push socket connected to a Pull, which you may see in a divide and conquer type arrangement. ZeroMQ is a C library that contains a bunch of insane sockets, that provide a very very cool abstraction over the typical socket code you would find yourself writing. It provides building blocks by way of a standard set of sockets that have been built with certain scenarios in mind. The people that make it were instrumental in the advanced message queue protocol (AMQP) being written, and are very big in the messaging world. If you have ever written any asynchronous code, and have had to deal with shared state, and have had to deal with that, you will know that that brings locks/semaphores etc etc. Now imagine a world where you don’t care about locks, semaphores etc etc, you just pass a message, and there is no shared state to worry about. Welcome to messaging. That is how you can write systems with a high throughput of messages per second, without the overhead of shared state management. 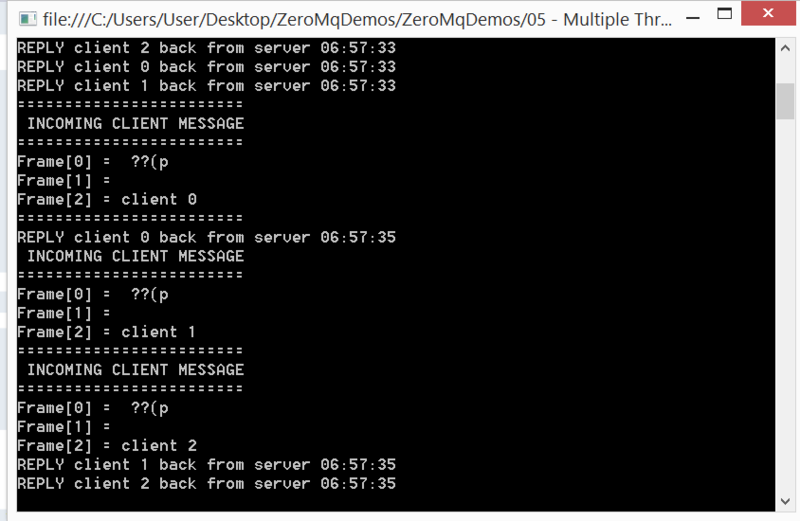 Zero is at its core a messaging library. It can be setup in a brokerless manner or also used broker, or even peer to peer. It is sockets that make it powerful. They are the fundamental building blocks, which you may use to create large distributed architectures, or very small ones. I would urge you all to read the book, or check out the guide, they have changed the way I think about certain tasks for sure. Where Do I Get The ZeroMQ library? First things first, I mentioned that ZeroMQ is written in C, but has many many language bindings. There is in fact a C# binding that you could use, which is the zmqcli binding. The thing with that, is that the errors you get are quite confusing at times, as it has a tendency to show the actual C error code. I wanted (if possible) to use an entirely native port of ZeroMQ, luckily for me there is just such a thing, by way of the NetMQ project. That is the library I will be using throughout all my posts. So without further ado lets get down to see a very simple example. The example is dead straight forward, we send a message from the client to the server, and the server sends a message back. This is a (extremely simple) example of the Request/Response pattern, of which we will see a lot more examples. Zero also supports publish/subscribe which we will look at too (though not in as much detail as request/response). Ok, so it does work, that is quite mad. So how does it work? We are able to create a request/response pattern, by using specialized sockets that are geared towards working in the request/response scenario. There is this magical NetMQContext. This is mandatory and must be used whenever you use ZeroMQ sockets. There are a couple of specific things to talk about in request/response, in that those type of sockets are assumed to be 1:1 request/response. So If you call ReceiveString() twice on the clients request socket without the servers response socket sending something you will get an Exception, as can be seen in the screen shot below. Here is the code running in separate processes, where it can be seen that we did not have to do a damn thing to change the server code at all we just moved it around to run in a new process rather than a new thread. Where Is The Code For This Article?